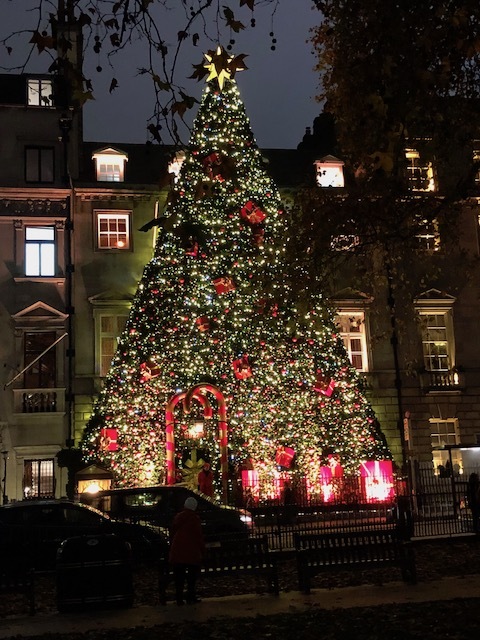 Well although we are back home now in Eleuthera – a few tales of culture vultures in London. 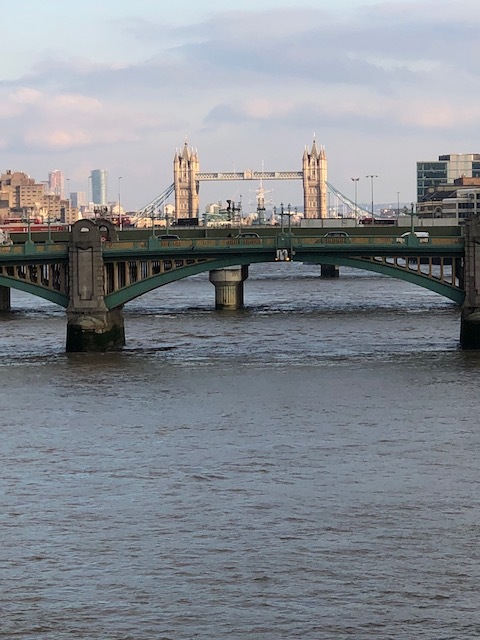 I had never visited Westminster Abbey in my life – so I had decided when we were planning our last minute trip that a tour of the Abbey would be top of the list of cultural pursuits ….. It was such a treat. The scale of the Abbey is much more intimate than I expected it to be. It is so chock full of amazing features that it is impossible to take it all in with one visit. We had watched a documentary about the new stained glass window done by David Hockney – and installed in late September of this year. To see it in the setting was spectacular, the colors are amazing and it was commissioned to commemorate the reign of Queen Elizabeth II ….. To be honest the whole visit was worth it to just see this. 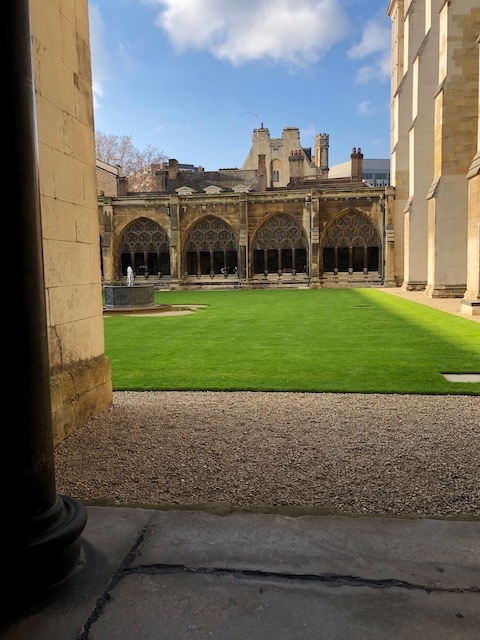 The cloisters at Westminster Abbey where you are allowed to take pictures. 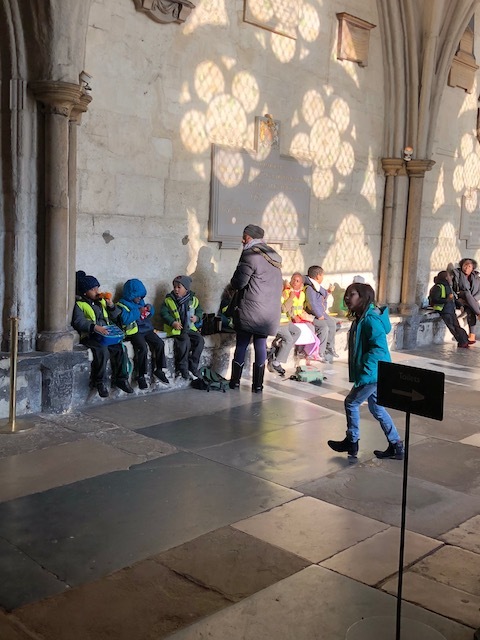 But there are many more special things to see and for me one of the most moving is the Tomb of the Unknown Warrior – it is the only commemorative stone in the floor of Westminster Abbey that is never walked over. There is also a wonderful tradition that all royal brides lay their wedding bouquet on that memorial stone. It was started in 1923 by the late mother of the present Queen – known as the Queen Mother – shortly after the stone was laid in 1920 and has been followed by all royal brides ever since. 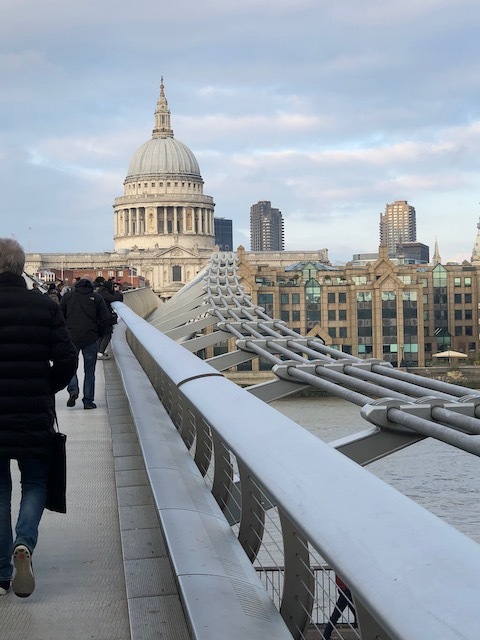 We also visited Tate Modern and had a lovely browse around there…..
A view of St Pauls Cathedral taken from the Millennium footbridge that joins Tate Modern on the south side of the Thames with the north side. Next up was the British Museum and a tour around the exhibition called – I am Ashburnipal – King of the World – King of Assyria. Stunning, well attended and beautifully staged it was a real treat. Then our obligatory look at the Parthenon Friezes and out into the cold again ! 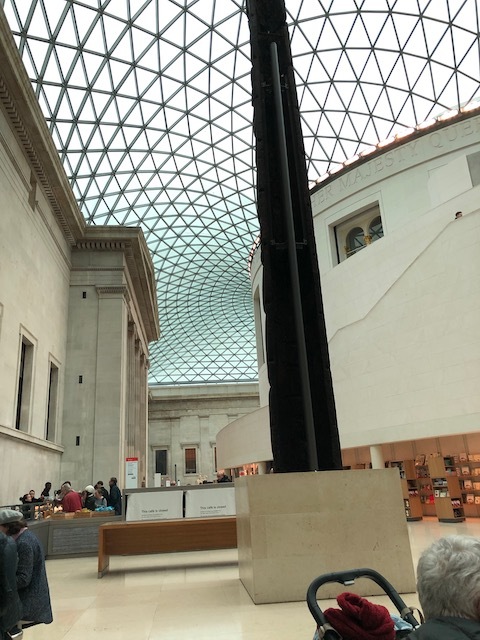 The enclosed courtyard of the British Museum with a stunning huge glass roof. 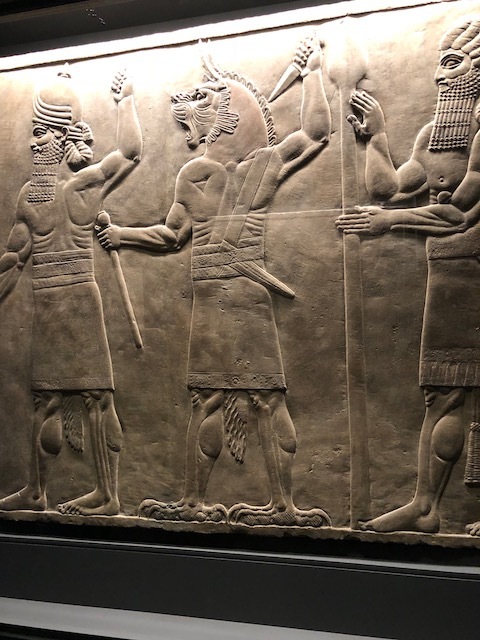 An ancient Assyrian frieze from the exhibition. Bob had a walk around the National Gallery while I was busy doing something else. Living in Eleuthera is absolutely what we love and where we want to be – but to be able to see the treasures and history that we did on this trip enrich and nourish our souls. Very important. 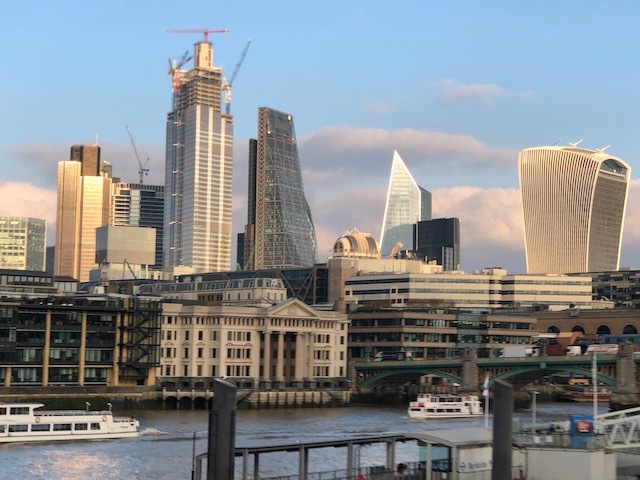 The buildings in London are another source of nourishment – they are beautiful – every where you look the detailing and architecture are stunning , and show the skill of the craftsmen who built them. 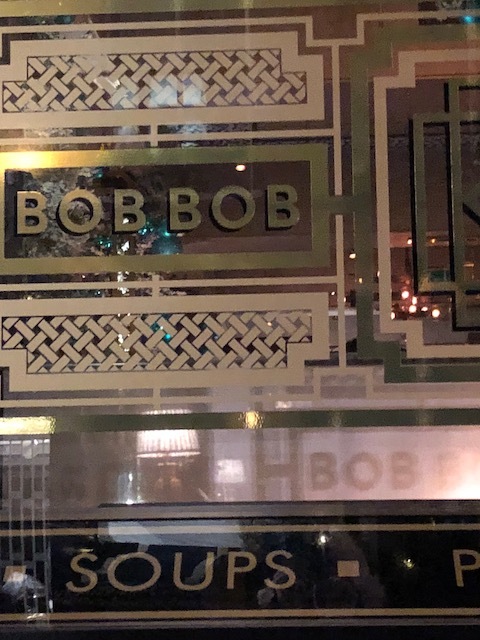 The ancient and the modern…..
Of course there were plenty of food delights as well – Bob had a delicious bacon roll at the Wolsley – a real treat. 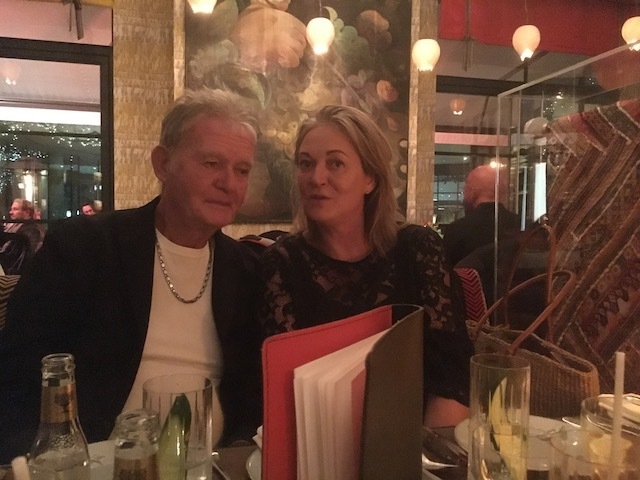 We also had a fabulous Indian meal at a restaurant called Darjeeling Express – totally vegetarian for me …… On the last night we were in London we ate at the Ham Yard Hotel. part of the Firmdale Group of hotels. 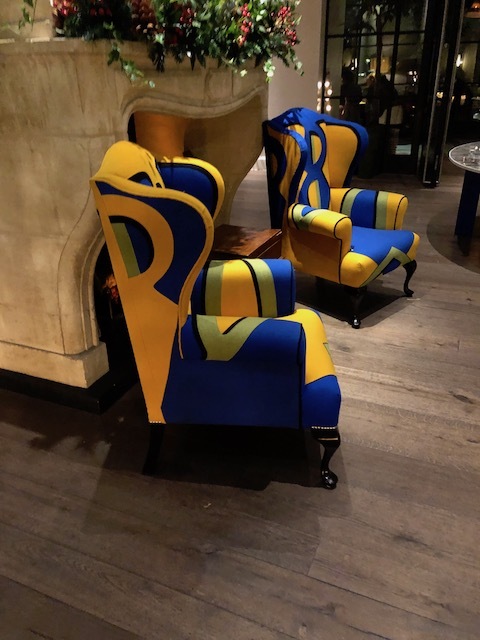 You have read on my blog before about our love of the Crosby St Hotel in New York – well this is in the same group with a stunning interior by Kit Kemp – for me an inspirational interior designer. And so we left London on a cold grey rainy morning to fly back to Eleuthera – our home and where we want to be. We had a wonderful time seeing friends and family and feeding our souls as well as our tummies – but goodness it was great to see the sun and feel really warm again…….. This is not a tree in front of a building – it is is treatment on the facade of the building – spectacular ! It is the new Annabel’s nightclub in Berkley Square. 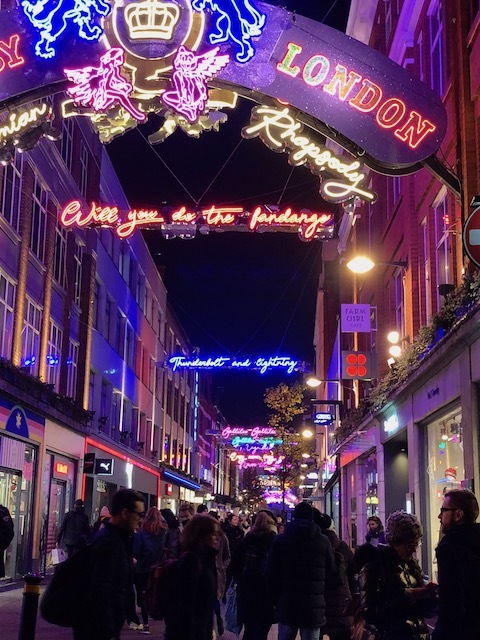 Carnaby St all lit up …..
Cathy, Dave and I were in London in September, like you, catching up on the cultural offerings we had missed on previous trips. We saw a fabulous Picasso exhibit at the Tate Modern, his work from just the year 1932. Westminister is so fabulous, so much history right under your feet! We had fabulous meals in Mayfair. Remind me to list them for you before you and Bob go next. London, one of my favorite cities!! Does a “bacon roll” = a bacon sandwich? I think I had one once in England……and survived! Regardless, made me VERY hungry. Great to hear from you as always ! Thank you so much for the visit to London. Next best thing to being there! My, my……..Annabel’s! My late husband was a member. I remember the old club. “Times, they are a changing”. Been to a few Sunday services at Westminster. Nothing like home! You lucky people!